Although the statistics for last year are not yet available for all countries in the world, 2015 was an above-average year for the global tissue business and industry. Based on our current estimates, worldwide tissue consumption grew to approximately 34.8 million tonnes in 2015, up more than 1.3 million tonnes from 2014. 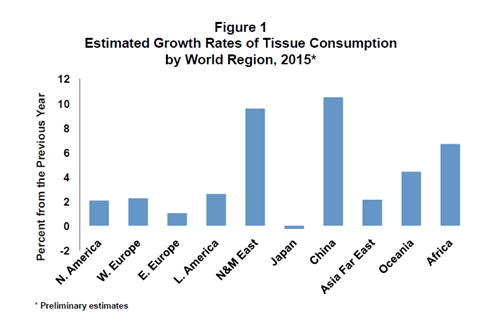 According to the current data and estimates for countries which have not yet published their final statistics, the global growth rate of tissue consumption was 4.0% in 2015. This is an exceptionally strong growth compared to recent years as the global growth rate was not more than 3.2% in both 2014 and 2013, 3.5% in 2012 and 3.6% in 2011. This growth also exceeded our expectations, since the RISI forecast was 3.7% for global tissue market growth in 2015. One could ask what the reason for this sudden acceleration of growth in tissue consumption was. Although the global economy continued to grow, real global GDP growth for 2015 was not more than around 3% and was actually below the growth in previous years, mainly because of negative growth in some major economies, such as Russia and Brazil, and also due to slowing growth in China. There is no single reason, but rather a number of positive developments in different regions, which will be briefly discussed below, that positively contributed to global tissue consumption growth. In North America, the US economy was relatively strong, which helped AfH tissue demand in particular, the growth rate of which exceeded 3%. Total tissue consumption grew by 2.2% in the USA, while the Canadian market was rather flat. North American growth exceeded 2% in 2015 after growing 1.3% in 2014 and 1.4% in 2013. The region continues to have the largest tissue consumption worldwide, and so this acceleration of more than 50% in the growth rate made a major contribution to the global growth rate. Western Europe was another positive surprise. The region had suffered from the consequences of the 2009 Great Recession for years, particularly due to problematic developments in Southern Europe. In 2015 the Southern European economies started to recover, and tissue consumption reacted rapidly, especially AfH tissue consumption, which picked up quickly. Total Western European consumption recorded a growth rate of 2.2-2.3%, and while some revisions may still occur, this was clearly more than in previous years (1.2% in 2013 and only 0.4% in 2014). Our forecast for 2015 was 2.0%, only slightly lower than the actual outcome. Eastern Europe and Latin America experienced rather disappointing developments. In Eastern Europe, the main factor was the conflict between Russia and Ukraine, which resulted in Western sanctions against Russia and threw the economies of both countries into a deep recession. Some other countries, such as Belarus, which is a major trading partner with Russia, were also negatively affected. 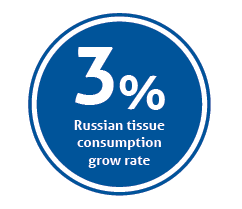 Russian tissue consumption continued to grow despite the recession, but at a low rate of about 3% instead of the 9-10% recorded before the crisis. 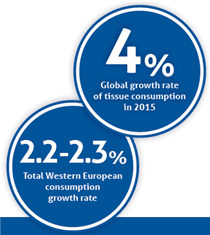 Total Eastern European tissue consumption did not grow by more than about 1% in 2015, according our current data. In Latin America, several economies were struggling, led by Brazil with a major GDP decline (3.8%) and Venezuela (almost 10% decline). Growth also slowed in many other countries, with a few exceptions such as Mexico, a few other Central American countries benefitting from US growth, and Peru. Argentina’s economic growth, although slow, improved from 2014. Tissue consumption declined in Brazil and Venezuela (according to our estimate as no reliable statistics are available for production). Latin American tissue consumption grew by about 2.6% based on our (still preliminary) data, with only a couple of positive surprises, such as Argentina. The Near and Middle East continued to grow rapidly as usual. We do not have all the figures confirmed yet, but the largest market, Turkey, showed a very respectable growth rate of 14% in 2015. Iran is another market which showed good growth. We believe that regional growth was very close to 10% in 2015. In the Asia-Pacific region, the Chinese growth rate of 10.5% in 2015 clearly exceeded our expectations. The Japanese market recorded a small decline, and the Asia Far East region recorded rather weak growth (our current figure is only 2.1%), mainly because South Korean consumption was down by more than 6% in 2015 after a major 10% growth rate in 2014. We think there is some statistical discrepancy in the South Korean statistics (production) and that the 2014 consumption figure was erroneous. Oceania showed a good growth of more than 4% in 2015. Africa has benefitted from the new capacity recently started up in North Africa, which has had a push effect on tissue consumption in this sub-region. Most actual import figures for non-producers are still missing, so our figures are partly estimates, but it appears that consumption may have grown by more than 6%. The South African tissue business is again picking up and new investments are underway there as well, which will likely mean a new growth phase in the country again. 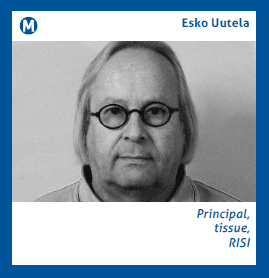 Share the post "“Exceptionally strong growth” at 4% for the global tissue industry in 2015"